Her two boys are older, and her working class husband Louie (David Denman) has their life path mapped out. Everything Agnes does is perfection, the pieces of how she manages her life, family and church fit together in a rote and routine pattern. A couple days after her birthday, she has a moment to herself and opens one of the presents… a jigsaw puzzle. She puts the thousands of pieces in front of her and before the afternoon is up, she assembles it. This begins a journey for her. 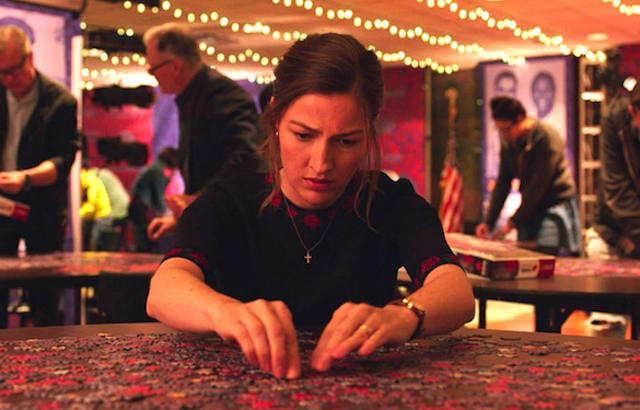 She seeks another “puzzler” in New York City, and lands on Robert (Irrfan Khan), a competitive puzzle champion who is in need of a partner. For the first time, Agnes has a talent apart from her family, but will that new purpose change everything? Marc Turtletaub can certainly relate to that type of change in his own life. After years of being a producer on some of the most beloved indie films of the last ten years… including “Little Miss Sunshine” (2006), “Away We Go” (2009), “Safety Not Guaranteed” (2012), “Louder Than Bombs” (2015) and “Loving” (2016)… he decided to try directing, and his first feature was the cultish “Gods Behaving Badly” (2013). 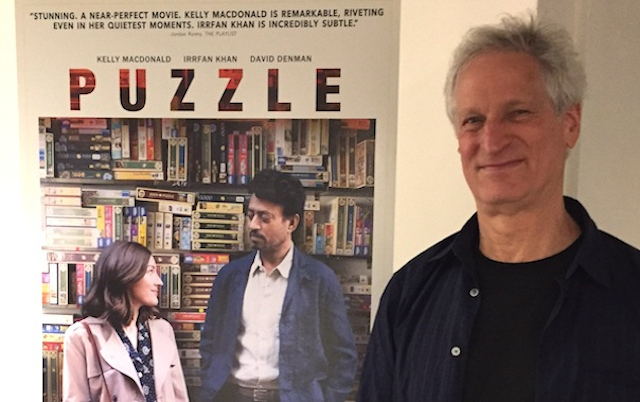 He came upon the “Puzzle” script, adapted from an Argentinian film by Oren Moverman and Polly Mann, and made it his second turn in the director’s chair. The film unfolds in a sensitive and empathetic way… virtually everyone has a hidden gem of possibility within them… sometimes discovered, sometimes hidden and sometimes never realized. All those scenarios swirl around Agnes, and they conflict throughout the film. Also notable is David Denman as Louie, her loving but perplexed husband. The way he handles her transition has roots in the character’s past, and the actors – under Turtletaub’s direction – brought that moment expressly to light. The “Puzzle” becomes life itself. In the following PART ONE Podtalk with Patrick McDonald of HollywoodChicago.com, Marc Turtletaub reflects on the elements of “Puzzle” he felt closest to, and the admiration he had for his fantastic cast. In the PART TWO, the second time director talks about lessons learned, both in guiding a film and being a producer on several great independent works.